The key to climbers is to train the canes as near to horizontal as possible. A good structure of horizontal branches dramatically increases the number of flowers. Climbers that are allowed to grow straight up will have flowers only on the tips of the canes. Newly planted climbers won’t need much pruning the first year or two. Just tie in any canes that have developed over the summer and cut side shoots back to about 6 inches. The rose in this picture would have most of its flowers at the top. To prune an established wall trained climber, start by taking a critical look at the plant’s structure. Identify two or three of the oldest, less productive canes for removal or cutting back. Decide which of the newly developed canes you want to keep and where they would be best tied in. Look for dead wood, weak thin growth and awkward branches. Try to make a plan before you start cutting. Once you have your game plan, start by cutting away what you don’t want. The oldest branches can be cut at ground level, or at a low point where you want a new branch to form. Keep an eye on where the buds are and make the cuts just above buds that are pointing in the direction you want new growth to go in. Cut out thin weak growth, dead wood and awkward crossing branches. Leave the side branches on the remaining canes for the time being. Tie remaining canes onto the supports, spacing them evenly to get good coverage. 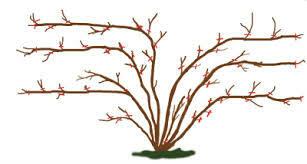 Now prune the side branches, or laterals, growing out of these canes down to 3 or 4 buds. Cut just above an outward facing one. Remove any remaining leaves, an important step in disease control. Lastly, rake up any fallen leaves off the ground, lightly fork over the soil around the base of the plant, apply a couple of inches of compost and you’re done. The steps for pruning a rose trained over an arbour or similar structure are pretty much the same. 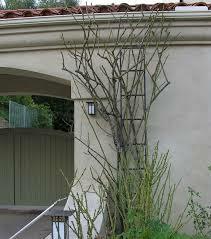 Try to train some of the branches in “S” curves up trellised sides or wrap them around the support posts. Be sure that the branches over the top of the structure are tied down securely to prevent wind damage and to promote good flowering. Cut back side branches to two or three buds. See how this Don Juan Rose is tied to the top of the arbour, producing many side branches and lots of flowers.